QHP has been strong enough to add more than $15 million to profit projections. Humana Inc. (NYSE:HUM) saw a big increase in individual commercial health insurance sales in the first quarter. The number of people covered by Humana individual policies increased to 715,600 at the end of the quarter, up from 460,800 a year earlier. 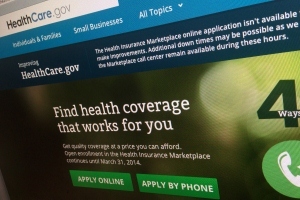 The company received 270,000 Patient Protection and Affordable Care Act (PPACA) exchange applications for “qualified health plan” (QHP) coverage that was supposed to start in the first quarter and 430,000 for QHP coverage starting between April 1 and June 30. More than 75 percent of the consumers who sign up for exchange QHP coverage are paying for the coverage, executives said during a conference call with securities analysts. Humana held the call to go over first-quarter earnings. The company as a whole is reporting $368 million in net income for the latest quarter on $12 billion in revenue, compared with $473 million in net income on $10 billion in revenue for the first quarter of 2013. Originally, the company was expecting to deduct about $75 million to $140 million from operating results this year to account for investments in exchange QHP sales. Because exchange enrollment has been stronger than expected, and the company can spread the startup costs over a bigger-than-projected customer base, the company is cutting the expected cost of exchange QHP investments to about $60 million to $115 million. Bruce Broussard, the president of Humana, said the company has too little data to know what QHP enrollee claims will look like. Humana is looking closely at early pharmacy claims and other medical data for clues, Broussard said. “We remain cautious about not getting ahead of ourselves in interpreting this data, but we are not seeing any deterioration from our expectations,” Broussard said. James Murray, the chief operating officer, said 2015 rates will have a “bit of conservatism” built into them because the company will have little or no information about exchange QHP claims when it develops the rate filings.